British boxer Dereck Chisora and WBA, IBF, and WBO Heavyweight champion of the world Wladimir Klitschko reignited their feud with a heated confrontation in an Ibiza nightclub last week. The two boxers had to be pulled apart by bouncers when they confronted each other in the nightclub. The two heavyweights, who clashed in Munich last year, were both on holiday on the island when they came face to face. Chisora offered a hand to the world champion who pulled him towards him before the pair were separated after an exchange of words. 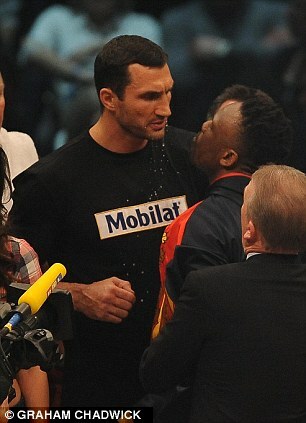 'I saw Wladimir, we had a little conversation in a club, it wasn't a great conversation,' Chisora told ATG Radio. 'I walked in - David Guetta was playing - and he was sitting down and then got up. It was only when I got to my table and looked up he was behind me. The pair are far from strangers following the shameful scenes in Munich last year when Chisora spat water in Klitschko's face in the ring moments before his world heavyweight title fight with the Ukrainian’s brother Vitali. The 29-year-old went on to lose a unanimous points decision and later brawled with fellow heavyweight David Haye at the infamous post-fight press conference.